Over the coming weekend, historians will join our colleagues in the social sciences and humanities in Regina for the annual Congress of the Social Sciences and Humanities, during which the Canadian Historical Association (CHA) will meet. This year, the CHA has been organized around the theme of “Gathering Diversities,” reflecting upon how both our understanding of the past and historical methods have been shaped by diverse and divergent perspectives. You can read the program here. 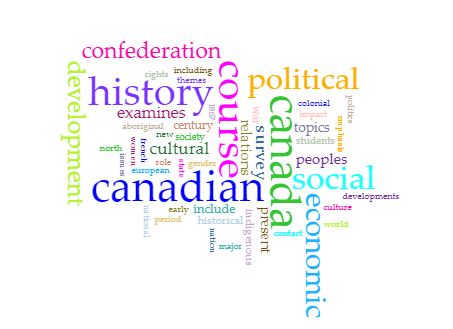 For the past several years I have examined the words most commonly used in the titles presenters have assigned to their papers, transforming the conference program into word clouds, in an effort to provide a cursory overview of the breadth of subjects being presented at the meeting. Occasionally, I have complemented this analysis with some sort of parallel examination of another aspect of the Canadian historian’s craft. One year it was abstracts from journal articles, another year it was past CHA programs, and last year it was a flash-in-the-pan #Canada150 TV special called The Story of Us. Figure 1. 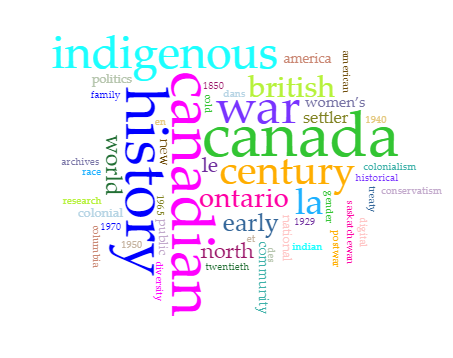 Common words used in Canadian-history course descriptions. 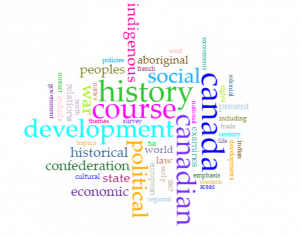 In total, about 15% (231) of the just over 1,600 (1,608) first- and second-year English-language history courses on the books at Canadian universities focus on Canadian history. Of that total, about 17% are what we might consider part of the “traditional” Canadian history survey course(s). 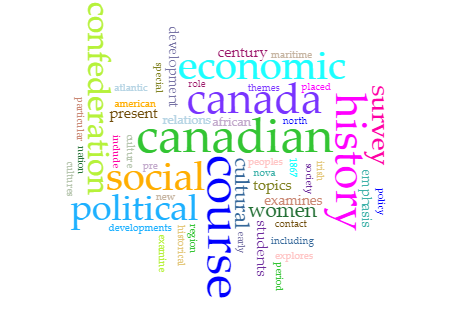 Usually (though not always) the Canadian history survey is divided into a first semester course on pre-Confederation Canadian history and a second semester post-Confederation course. The rest of the courses included here are more specialized, looking at specific historiographical questions, groups of people, or regional history. 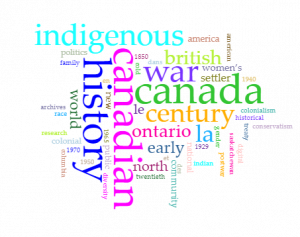 Combining each of these course descriptions (but not their titles), we can use Voyant Tools to determine the common vocabulary used to describe what is being taught in Canadian-history classrooms. Before getting into the details, however, it is important to point out the limitations with this type of approach. There are three factors that may give some history programs more influence in this analysis than others. More verbose course descriptions provide more data and therefore may skew the results. In the latter example, the word “treaty” is used twice, giving this entry more influence for that word. Second, calendar copies do not necessarily reflect the courses actually being taught at a university. In fact, it is quite possible that many of these courses have not been taught for years. Perhaps a symptom of this, the number of courses each history department lists in their calendars varies wildly. Some programs have as few as 14 history courses listed at the first and second year while a handful have over 80. I suspect that for the latter cases, these departments are not in the habit of removing from the calendar courses seldom taught. Programs with more courses on the books will have more influence in shaping the results. Third, the plethora of courses on the books at some universities relative to others points to one substantial difference in the place of Canadian history at some universities. Somewhat counter-intuitively, it is at the larger schools (Alberta, UBC, Dalhousie, McGill, Memorial, U of T, and York) where less than 8% of the courses offered are Canadian in focus (Bishop’s and Brock are also low); while smaller schools such as Acadia, Brandon, Mount Saint Vincent, Nipissing and UNBC have much more variety on offer (Concordia, Manitoba, UNB and Waterloo are also high). As a consequence, it is these smaller schools, with more options seemingly available to students, that have more influence in these results. If we weighted this to account for the number of students actually taking these courses, I suspect this analysis would look somewhat different. Finally, as I note every year, this is not an academic study. I have done the research for this essay over the past few evenings to provide an overview for discussion in the lead-up to the CHA. This is not a rigorous study. So, bearing all of this in mind, what do these descriptions tell us about what is taught in universities about Canadian history? 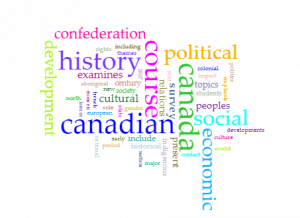 First, from a national perspective (figure 1 above), the top five most common words are: “social” (109), “political” (107), “economic” (83), “development” (69), and “Confederation” (66). None of these words should be surprising. Taken together they provide a fairly general and flexible framing for anyone teaching an introductory course. Importantly, however, when the word count for “Indigenous” (36), which ranks 10th, and “Aboriginal” (31) are taken together, they move into the fifth position (higher if “Native” is also considered). Of all specific groups of people noted in course descriptions, Indigenous peoples are by far and away the most frequently explicitly noted in course descriptions. The situation looks a little different, however, if we think about these courses from a regional perspective. The 11 universities west of Ontario use 2,634 words to describe 55 courses. The five most common words in their descriptions are “development” (29), “political” (27), “social” (24), “war” (18) and “Indigenous” (17). Much like in the national analysis, though, when “Aboriginal” (13) is added to “Indigenous”, it ranks most prominently. Figure 2: Common words in university calendar descriptions west of Ontario. In Ontario, which hosts the largest number of post secondary institutions (17), the top five are “social” (44), “political” (42), “economic” (32), “development” (26), and “cultural” (22), derived from 99 courses and a corpus of 3,776 words. “Indigenous” and “Aboriginal” are used 13 times each, meaning that they would tie with “development” for fourth/fifth place. The view from Eastern Canada, with which I have included Bishop’s, Concordia and McGill, is significantly different. 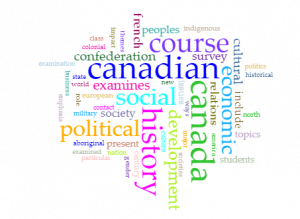 Though there are five fewer schools than in Ontario, Eastern Canadian universities (12) use more words (3,943) to describe their 77 courses. 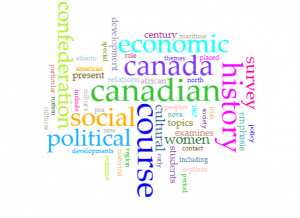 The top five terms in the east are “social” (41), “political” (38), “economic” (37), “Confederation” (30), and “cultural” (20). The east is the only place where “women” (17) ranked high (it is sixth), while “Indigenous”/”Aboriginal” is relatively low (11); interestingly “African” or “Black”, words which do not even appear in the other regions’ course descriptions, are cited 18 times, which would move it just above “women”. As we might expect, given the different focus of the CHA’s annual meeting, paper titles from this year’s conference program point in other directions. Much like previous years’ presentation-titles, the words “war” (17), “Indigenous” (16), and “British” (11) are near the top of the list. 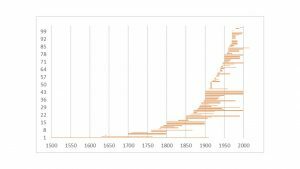 Interestingly, for this meeting “early” (9), “settler” (8), and “colonial” (6) also rank in the top ten when non-topical and very common words are removed. 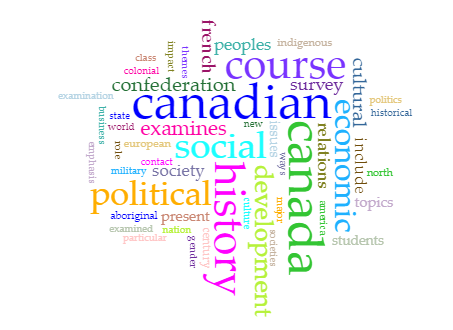 Except for Indigenous, none of these words rank highly in the course descriptions. The emphasis on “early” and “colonial” however, should not mislead you into thinking that earlier periods in Canada’s history are better represented than in past conferences; only about one quarter of the papers to be delivered next week address the period before 1867 (it was 20% last year), and just over one tenth address the period before 1800 (the same as last year). Unfortunately, because I did not include course titles in my analysis of course descriptions, I cannot compare the program with course offerings. 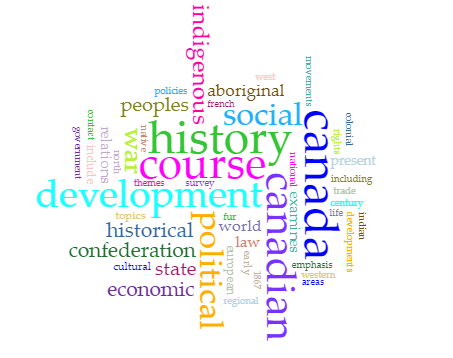 It is worth noting, however, that several history programs offer a breadth of Canadian history courses rather than just a single survey course or two courses broken up temporally in the mid-nineteenth century. These schools break Canadian history up into three or more distinct temporal units. From a regional perspective, much like when it was last on the Prairies two years ago, this year’s annual meeting better represents Prairie history than the CHA usually does. It is the region best represented this year with 27 papers addressing the region; though nationally- and Indigenous- focused papers (61) are more common in the program. This regional spike is somewhat common. In previous years, with the exception of when the meeting was held in B.C., local/regional history of the host institution has been more prominent. Finally, as usual, Active History has a fairly strong presence at this year’s meeting. Anyone interested in learning more about the Active History project or (better yet!) interested in becoming involved, we will be meeting over the lunch hour (12:00 to 1:30) on Tuesday 29 May in room RC 228.2. We hope to see you there. Thomas Peace is an assistant professor of Canadian history at Huron University College. Interesting observations, Tom. I have a question and a couple of comments. First, did you look at francophone universities in Quebec? My sense is that they (and probably McGill and Concordia too) offer more Quebec history overall and perhaps at the survey (1st and 2nd year) level. Second, on the question of larger universities offering less Canadian history, that’s not surprising to me: one of the byproducts of bigness is being able to cover more parts of the world. There may be more Canadianists in terms of numbers, but proportionally they will make up a smaller percentage of a large department. Consequently, the percentage of Canadian history taught will be less. There might be “much more variety on offer” in Canadian history at smaller schools, but there is greater geographic and thematic variety on offer at larger ones. Finally (and to add to your discussion of methodology), I’d add that university bureaucracies can provide disincentives to change course descriptions. Ours are pretty new because we revamped our survey Canadian history, but before that I’m not sure that those course descriptions had changed in 20+ years! As you note, descriptions don’t capture what is taught! Thanks for this piece – and the others you’ve written: you always give us something to think about! Another important consideration is colleges in BC that offer transfer courses to Unversity Credit. Many of the BC entry level insitutuions offer 1st or 2nd year courses particularly Canadian history to their transfer programs. This definitely would alter University offerings. This is really interesting, Tom, and I think the patterns you’ve identified are telling. At the same time, I’d add that as historians we always look for patterns, but we also know the devil is in the details. Brock is certainly an outlier in lots of ways, but the details reveal other things. First, on the number of course, we are low – to be sure – but we are low on Canadianists. Only 4 of our 21 permanent faculty teach Canadian courses (19 per cent – a quick look at obvious comparators Western, Trent, and Guelph show 33 to 40%). We made a deliberate choice around 2005 (when we were expanding!) to go global. We hired nine positions between 2004 and 2009, and only two of those were Canadian. Plus, that gets reduced still further because, for example, I teach courses in rural history and food history where Canadian content is significant, but not noted in the calendar descriptions. Second, on descriptions versus what’s taught, some of our descriptions hide content. Maureen Lux, for example, teaches medical courses that, not surprisingly, have significant Canadian and more particularly Indigenous content. I teach a course called War and Nationalism, but a third of the course covers Canada’s war in the West; the nationalisms we cover are English and French-Canadian, but also Indigenous – plus we look at colonialism abroad in the Boer War. The title is meant to draw students, but it’s also a slightly covert way to teach Canada as a colonial project without saying so. I’m sure some of these details exist elsewhere too, but it does very much mark Brock as a department that has de-centered Canada. And speaking of de-centering Canada – dropping your colonial survey?!?! ?